It's been something of a gaffe-prone week for London's two main mayoral rivals with Boris Johnson joining Ken Livingstone on the naughty step after he described St Patrick's day events as 'lefty crap' and linked them to Sinn Féin. 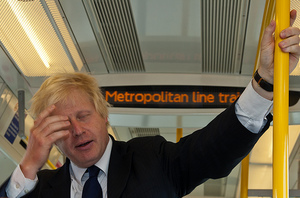 "Boris's lazy and stupid remark is utterly factually wrong. The fact is the annual St Patrick's Day event he refers to was a self-financing community event attended by a wide range of Irish actors and politicians from many parties, community figures and celebrities, including Bob Geldof, the Irish Ambassador, Dermot O'Leary, Richard Corrigan, and Pauline McLynn. It did not cost the taxpayer £20,000 and it was not a Sinn Féin event." It's certainly a bit of a sideswipe at Ken Livingstone; his office backed the event for six years and the former mayor is now working hard to bring London Irish voters on side. It's not so much that either Johnson's or Livingstone's remarks were calculated to offend — despite the outraged fury spiral circulating around the internet post-unwise comment, we don't tend to believe that Boris thinks all Irish are Sinn Féin any more than Ken thinks all Tories are gay. It's more that both men at times seem to demonstrate an alarming lack of judgement. We now await ill-judged comments from Green mayoral candidate Jenny Jones and Lib Dem's Brian Paddick and the resulting wave of national anger (or international, depending on what they say) to make up the full set.